I've been thinking about consistency for a long time. I've thought about doing a post on it and each time, it takes a different shape and I come up with a new reason not to do it. It mostly centers on the fact that I haven't felt like I've been all that consistent lately. Which is also probably why I feel the need to write the post. It came up again when my friend Molly over at Still Being Molly wrote this post called "Success Comes to Those Who Keep Showing Up" and I swear it's like it was written for me. So today I'm showing up and I'm going to finally do that post on consistency. 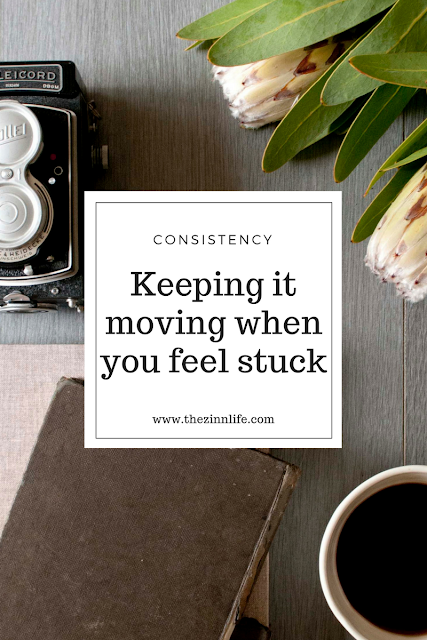 Consistency is when you keep coming back and pushing forward on something, even when it feels like you haven't moved an inch. It might only be an 1/8 of a centimeter. But you keep coming back. For me, this comes into play the most with my writing and my journey to a healthier me. I have always loved to write. When I was younger, I'd devour book after book and then, when I got bored, I'd write my own stories. I was never really super creative with writing new fiction stories, which is probably why I've never been able to actually sit down and write a whole book. I can't ever seem to come up with my own unique idea. But give me a really good starting point and I can do wonders! When I went to college, I minored in Writing. Holy reality check. It was hard. I'd always been told I was a great writer and then I had this professor that told me my grammar was terrible and my ideas were flat. What?! No way! I've always been the grammar nazi and everyone always loved my stuff and here's this guy telling me otherwise. But he was right. My grammar was terrible and my stories were flat. He pushed me. He made me think deeper about how I told a story, what adjectives I used, what voice I used or didn't use and I became a better writer for it. I learned that I do best telling my own stories, which is why I blog. That and federal regulations get really boring. But if you want to talk about any of the HUD regulations, sadly, I'm your girl! Blogging isn't my job, though. So it's hard to stay focused and consistent. I don't ever see this as becoming something that I do full-time because I like being a City employee! I love my job and I get to help people find and keep housing that probably couldn't do it on their own. And that satisfaction I won't get from blogging. But, in the same vein, the satisfaction I get from writing and sharing with people I also can't get from my day job. Next month will be a full year on this blog. Mostly posting three times a week, sometimes two, because...life. I've had blogs before, two actually, but this is the first one I've been truly consistent with posting. I've pushed myself and joined a blogger group, taken classes, branched out and tried new things. And some days it is truly disheartening to look at my numbers. I think "But I only have this many readers!" or "Only x amount of views this week?!' especially if it's on a topic that I think will get a lot of traffic. It's hard! And when you've got a busy schedule and you haven't done your blog work for the week and your post should be up tomorrow, you think, "Why even bother?!" Because I'm doing this for me. Yes, I love that I have people that read what I write. It's especially cool when I don't know you and you read what I right. Hello validation! But writing feeds my soul. I set out to do this blog, The Zinn Life, for me. To have an outlet, to maybe help someone else that's like me and trying to find their best self again, to write about shoes and pretty things and not write a compliance report. Knowing that is what keeps me going and what keeps me posting. My weight and I have been in an epic battle since day 1. I was a chunky baby and my rolls had rolls. But that's okay when you're a baby. It's the only time it's allowed, encouraged even, to be chunky. It's not so wonderful as you grow up. I'm not going to go into my battle with my weight, because I've written about it. But for the past year and a half, I've been on this journey to be a healthier me. I'm not focusing on my weight, but it is a big part of how you judge your success. Over a year and a half, I've only lost about 23 pounds. I've lost a good amount of inches and I've gained a ton of confidence in my strength and abilities. I"m stronger, I'm faster, and I'm generally happier. But then you get stuck. Getting healthy, losing weight, whatever you're trying to do is hard. It's HARD. I had to start taking before and after pictures in the beginning because the numbers weren't moving. I felt better, my clothes were fitting better, but my weight was exactly the same. And it was devastating. Part of it was that I was focusing on my working out and not on eating. Your diet plays a much larger role in your health than you can possibly imagine. I got the eating under control and that's when I really started to see a difference. Overall, I can tell that I've had some big successes. But when you get down to the day to day, week to week changes, it's nothing. And to quote Pitch Perfect, "A mistake can haunt you for the rest of your life and effect your children." Okay, maybe not that extreme. But you get it. It's rough. It's hard. It's depressing and if you think about it too much, you think, "Why?" When the scale creeps back up another two pounds, you think "Why am I even trying?" Because you're doing this for you. You can also do it for someone else (your kids, your family, etc), but deep down, it needs to be for you. When you're healthier, you're happier with yourself, you have more confidence and you're more likely to keep it moving and be consistent than if you give up. It's so much easier to pick back up after a frustrating day than to start all over. Trust me. I've done both many, many times. Know you're why. At the end of the day, knowing why I'm doing something is what always picks me back up. I blog for me. I'm working out and eating better for me. When you think about your why, not the results, it's easier to keep it moving. Give yourself a tiny pity party and get back to it. Pity parties are cathartic. Sometimes they just need to happen. You can't act like you don't feel what you feel, otherwise, you'll drown in all the feelings. Go ahead, feel it. Get angry, get sad, whatever you want. And then go right back to it the next day. Reward yourself. If you've been particularly consistent for a while, give yourself a treat. It's hard to be consistent! Life is busy and you've managed to keep a bunch of things going at one time. Celebrate you. I love this post! It is sometimes so hard to stay consistence when life throws crazy things at you. Rewarding myself little by little always helps me. Great post girl! Really great tips for being consistent! I feel like I constantly have to remind myself of the "why" for me. Why I'm there, why I'm putting time & energy into something. It keeps us in check to make sure we're doing the right thing for the right reasons. This is such an important lesson for me to keep on the forefront of my mind right now as I'm delving into a new career. These are really great tips for consistency and I could really use them! Molly's post was excellent. I think it's also important to set realistic goals and to identify why you might be missing some of your goals (maybe they need realigning). Other times, I think we just have to "show up". Thanks for sharing this!